EnviroInsite can print to any Microsoft (MS) Windows printer accessible to your computer. To print, set the view to show only what you want to print. Modify the view shape to reduce the amount of white space around whatever is in the plot window. Select File> Print from the main menu and the Print Preview window will appear. 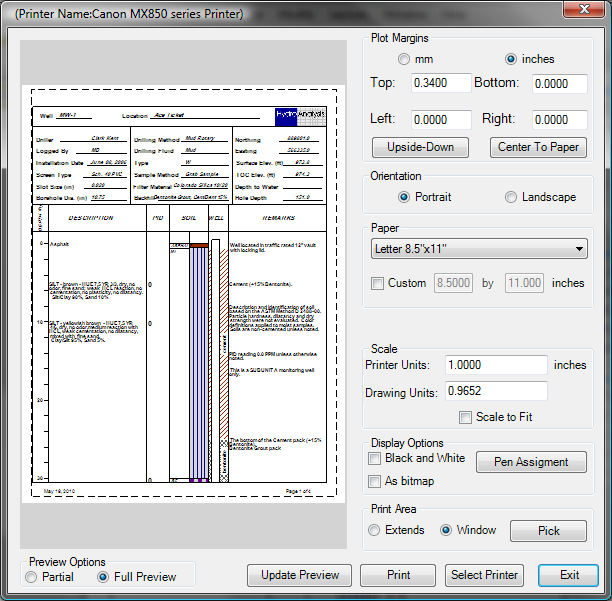 Modify the plot margins, paper size and orientation, and printed scale. Select to print in color or black and white. Select any MS Windows compatible printer by clicking the Select Printer button and have access to all of the print setup options. There is no scale set when viewing on the screen since the scale changes as the window size changes. Therefore, the printing scale needs to be set. In most cases you will want to check the Scale to Fit box to have the image fill the entire printed page. You can select a particular print scale by entering values under Printer Units and Drawing Units and removing the check from Scale to Fit. View a training video on printing to a particular scale here. The preview options are partial or full view and are selected by clicking the desired radio button on the bottom of the Print Preview window. Select Full Preview to see the image as it will be printed. Under Partial Preview, you will see only where the plot window will appear on the printed page. You can select a portion of the window to print by selecting the Window radio button in the Print Area portion of the Print Preview window and then selecting the Pick button. Use the mouse to select the window that you want to print and the Print Preview window will return. Click the Update Preview button when you have made changes on the Print Preview window and want to see how the printed page will change.